Move over, Wonder Woman: There’s a new shero in town. 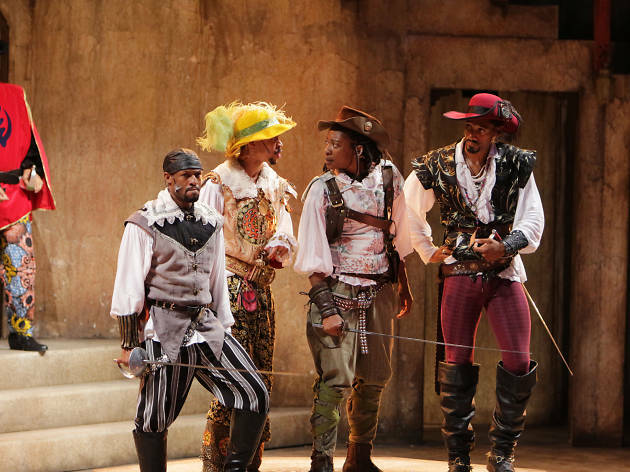 In Alexandre Dumas’s 1844 French novel The Three Musketeers, the aspiring swashbuckler D’Artagnan insists he’s “not a boy.” That’s literally the case in Classical Theatre of Harlem’s spirited staging, which casts the winning Miriam Hyman in the role—and boy, is she worth idolizing. She easily keeps up with the sword-fighting trio of the title, both in battle and in the bedroom, as they seduce ladies and fight against the tyranny of Cardinal Richelieu (Michael Early) and his evil agents Rochefort (a menacing R.J. Foster) and Milady de Winter (Piera Van de Weil, pretty and deadly). And in her acting, Hyman bests everyone else onstage; she alone proves able to navigate the production’s tonal inconsistency. 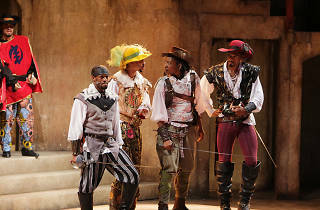 Although this free, alfresco, family-friendly show has many strong elements—Rachel Dozier-Ezell’s sumptuous 17th-century costumes, Emmanuel Brown’s lively fight sequences, an adventuresome cast—its attempt to fuse comedy with action-adventure doesn’t always fly. Catherine Bush’s streamlined script is sober and straightforward, but director Jenny Bennett has thrown in anachronistic jokes and gags, some of which work better than others. (Audiences were delighted at the Musketeers’ dabbing.) Sluggish pacing also prevents the production from being a total victory. Still, it’s a worthy effort with many exhilarating moments, especially when Hyman is onstage. You’ll be all for this one. Richard Rodgers Amphitheater (Off Broadway). By Catherine Bush. Directed by Jenny Bennett. With ensemble cast. Running time: 1hr 25mins. No intermission. Through July 30.